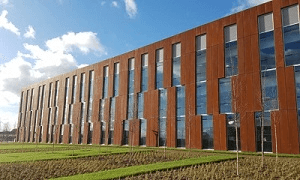 We thought we would share a photo of the recently completed Thames Valley Science Park Gateway building showing the Cor-ten and glazed facade in the winter sun. The panels were designed and fabricated to incorporate the window returns, soffit’s and copings into each individual panel to reduce unwanted joint lines. We look forward to following the site weathering progress of the facade over the coming months as it takes it’s place on the site with its particular landscape and surroundings.